Steam’s hottest game has no built-in way to stop jerks from ruining your fun...which means that players have to get creative if they want to maintain the peace. 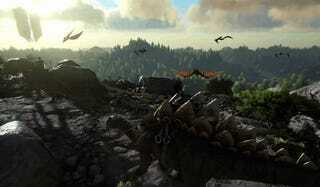 Ark: Survival Evolved is a dinosaur hunting game where players have to use the environment to, well, survive. You know the spiel: you can craft, you can build, and so on. Think of it like DayZ or Rust, but with dinosaurs. People like it so much that Ark has been tearing up the Steam charts since its release in early access. It’s not perfect, of course. One thing players seem to agree on is that the game can be a messy hotbed for jerks and assholes. One of the most top-voted reviews on Ark’s store page says that it is “literally a griefers paradise” because “everything [you build] for can and will be destroyed, killed, and looted...while you’re sleeping ever so peacefully in your bed.” While some players feel helpless to this fact, others are being a bit more proactive when it comes to griefers. “We have an infamous scoundrel and rapscallion locked in a cage,” Seagull reported. “Whenever he gets low health from punching the wall I tranq him and feed him blood until he’s full HP. We’ve had him in there for quite some time. “Maybe he will learn manners when he is released,” another mused. “You are beyond the worst scum in the game mister Seagull,” one commenter said. “Like the absolute worst...If the police actively held a man in a 1x1x1 prison and repeatedly tranqed him and force-fed him blood for a reported 10 hours against his will and without trial then yes. I would call them scum and kick them in the nuts. I just wanted to update this to provide some posterity to the situation and everyone commenting. We did imprison Ricky, for raiding and such, it was fun and we invited him to our TS and we all had a great time. After getting to know him more, and finding out how absolutely insane (total headcases) some of the tribe leaders are on our server, we now play with him as a member of our tribe. Right now we have become friends and are having fun together and he is not destroying anybody’s stuff. Maybe that’s stockholm syndrome. Or maybe it’s the brilliance of Ark: Survival Evolved and its players shining through.